Divex SLS Mk IV Deep Diving Bail out system. 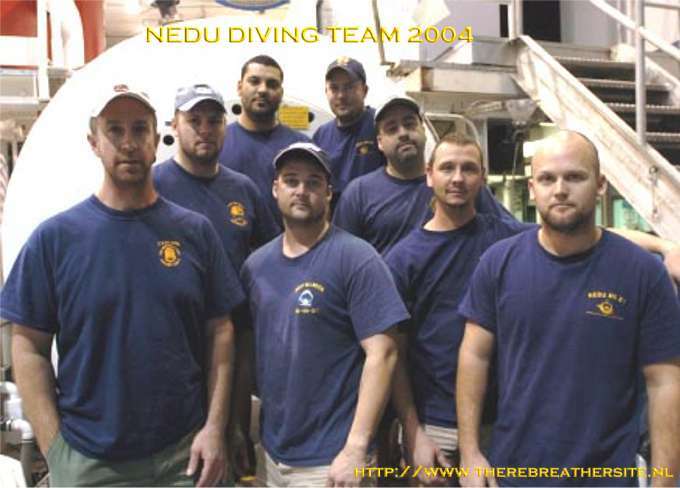 In March 2004, the Navy Experimental Diving Unit (NEDU) performed an extensive saturation dive in the huge Ocean Simulator Facility in Panama City, Fla., USA. 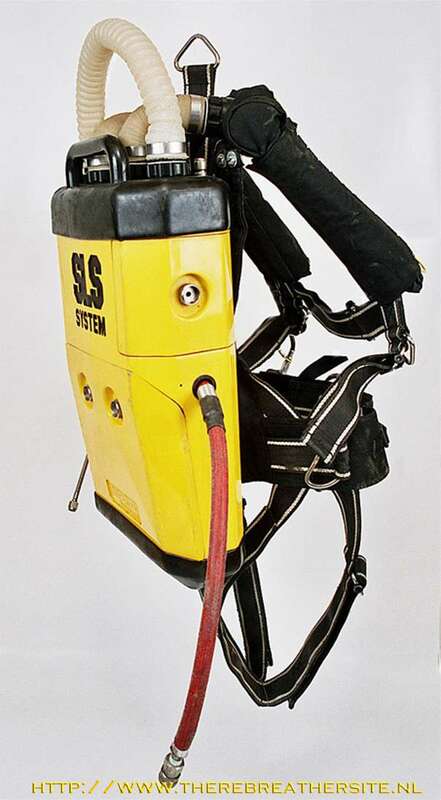 The operation objective was to evaluate divers and equipment, and the Divex SLS MK IV semi-closed circuit emergency bailout backpack with an Ultrajewel 17-C gas-reclaim helmet. 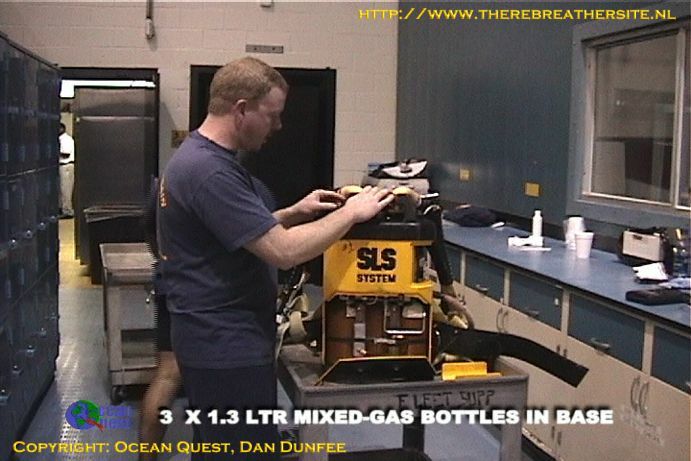 More detailed technical information on this system is included in the Rebreather Data Base listing for individual units. 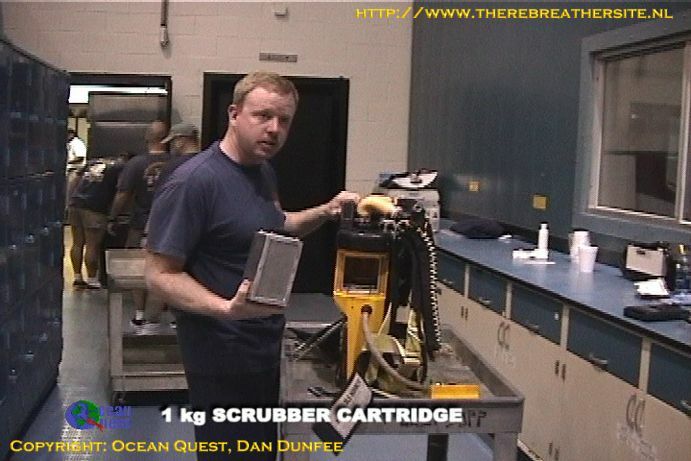 Ocean Quest (OQ) was the only organization invited to do a video-documentary of the Operation. The 17-day (including decompression time) saturation DIVE operation, included 8 divers in ‘wet’ dives, in 34 *f water, down to depths of 22 ata (725 ft). At the max dive depth, a heliox gas mixture containing about 2% Oxygen was used to maintain PPO2 values of about 0.4. 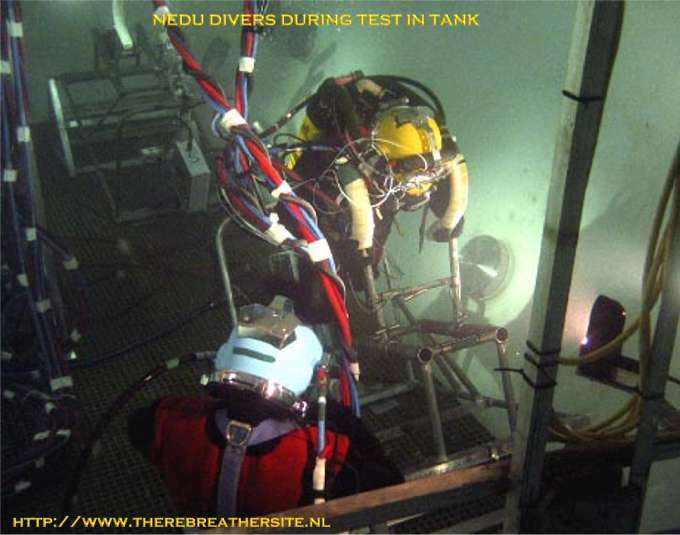 Main test dive sequences were conducted at about the 100 and 725 fsw depth levels. Test evaluations at these 2 depths consisted, first, of subjecting each test diver to rigorous psycological and mental acuity tests. These test results were compared with previous identical tests on the surface, to determine the influence of different depths and gas mixes on each divers mental characteristics and responses. Extensive technical instrumentation was installed on the diving equipment, and physiological instrumentation on the divers. Diver instrumentation included electrocardiogram (EKG) and even rectal temperature probes to evaluate ‘core body temperature’ responses when hot water to the divers thermal suit was turned off as part of the 34 ºF diving tests. In each test cycle, each test diver was first ‘calibrated’ by having him ‘work’, at an energy level of about 50 Watts, on an ergonometric bicycle, whose work level could be controlled, during the tests, from the OSF Medical Deck. After ‘calibration’, the divers’ surface supply of mixed gas and hot water was cut off, forcing the diver to ‘go on’ his bailout backpack. The diver was then ‘worked’ on the bicycle until either….his backpack gas supply…or his scrubber chemicals….or the diver himself physically gave out. As usual in Navy experimental diving, a safety diver was always at the test divers side to help with conduct of the testing, or come to the test divers aid in case of an unplanned emergency. The Divex SLS MK IV bailout backpack system performed very well, and all test objectives were met. Additional testing, planned for 2005, will extend the maximum test depth down to 1,000 FSW. 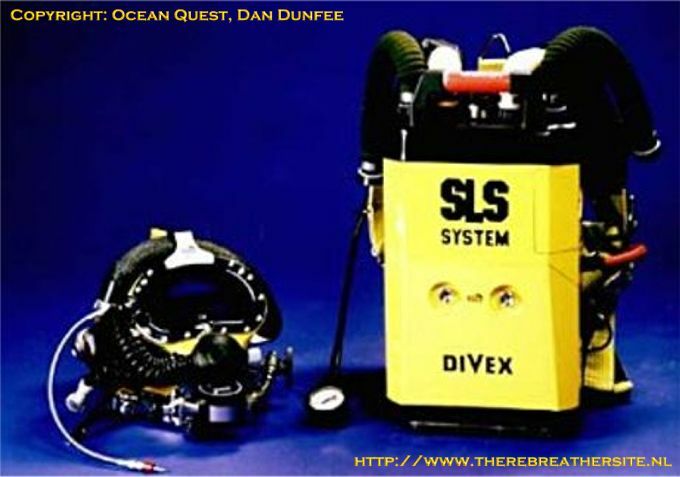 The Divex Secondary Life Support (SLS) System is an emergency breathing apparatus intended for the use in the event of a fundamental failure of a diver’s primary life support umbilical. Designed in response to the acknowledged need to enhance diver safety, as man works to extreme depth in the world’s most hostile environments. 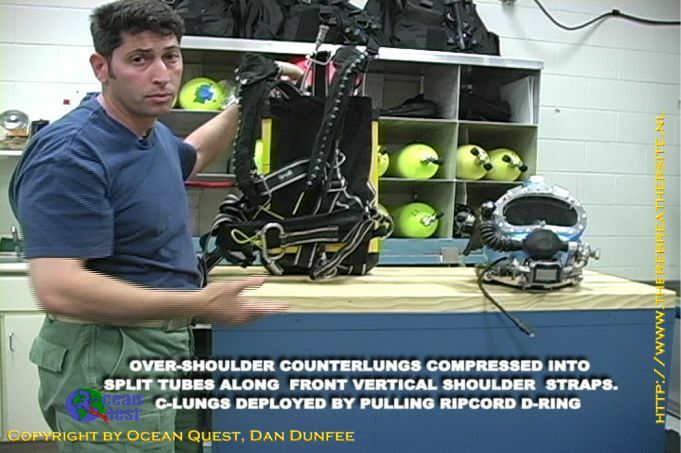 It operates on a semi-closed circuit rebreather principle independent from the primary system. 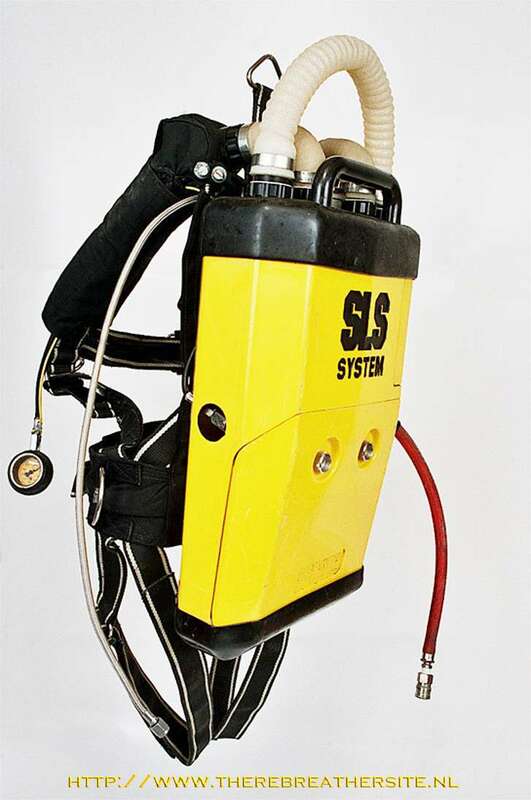 The SLS System provides the diver with a minimum supply of 13,5 minutes of breathing gas (heliox) at a rate of 62.51 RMV (litres per minute) which satisfies Norwegian Petroleum Directorate (NPD) Regulations 1995, Section 38. Comprising a self-contained backpack and Helmet that have been the subject of considerable development. The picture shows the SLS Mk IV fitted to a Divex Ultrajewel 17c Gas Reclaim Helmet fitted with SLS interface. a) Improved serviceability of the redesigned backpack housing and scrubber housing. b) Improved scrubber door sealing arrangement and strengthened door. c) Refillable scrubber canister with screw on cap that is easier to fill. d) Positive pressure indicator (Rotowink) that allows the diver to visually check the integrity of the system. e) Improvements to harness and actuation system. Check out the NEDU test facility movie, size: 5 MB you need Windows Media Player or other suitable player. 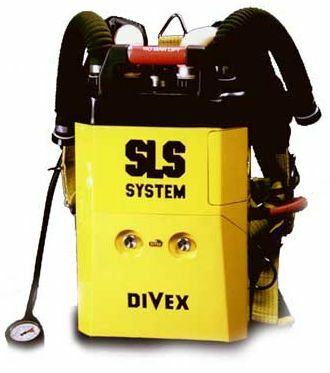 The Secondary Life Support system, SLS made by DIVEX UK is a breathing system for deep diving operations where the diver descends to his working place in a diving bell and then locks out from the bell and performs his tasks at a depth reasonably close to the lockout depth. 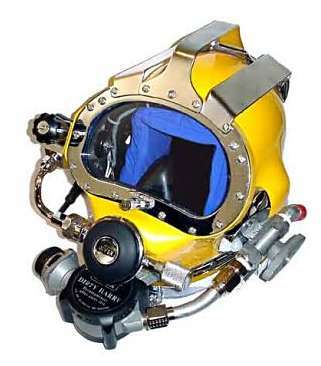 The primary system is a normal deep diving version of the Kirby Morgan helmet, which is an open circuit demand system, preferably equipped with a gas reclaim system in order to save gas. The bail out system in designed to help a diver to get back to the diving bell without being dependent on the umbilical supplies gas, electricity and hot water. Since the unit is to be used for bell lockout through a 700 - 800 mm hatch, the size is important. 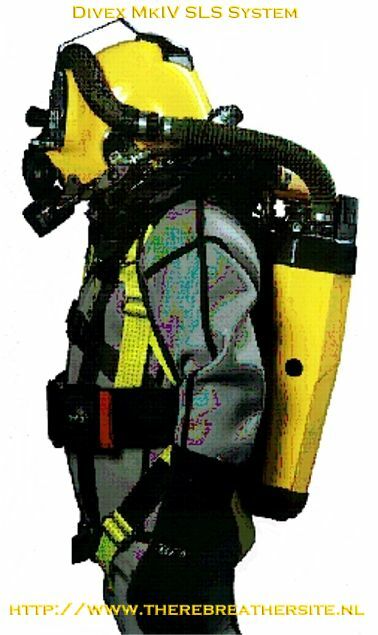 The secondary, aka bailout, system comprises a complete semi-closed rebreather. Inside the oro-nasal inner mask (that is standard on the KMB helmet) a mouthpiece is hidden. By rotating a knob on the right side of the helmet the mouthpiece is removed from its retracted position and is positioned so it can be bitten into and breathed through. This means that the bailout breathing gas has a flow path that is completely independent from the primary one. The breathing circuit has a demand valve integrated allowing the first breath to be taken and to supply the system with gas when the ambient pressure is increased. A small secondary pressure regulator that is fed from the umbilical gas supply is used to maintain a slight overpressure in the SLS during non-bailout operation to ensure that water is kept out of the bail-out system. 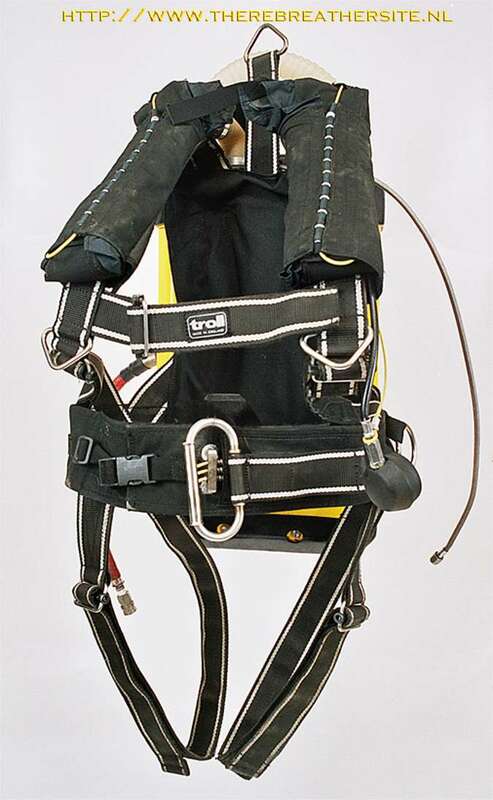 Activation of the fresh gas flow and release of the two over-the-shoulder (OTS) breathing bags is made by pulling a rip cord using a handle similar to the one used by a parachutist. The scrubber is maintained pre-heated ready for immediate use using the normal hot water supply for the divers hot-water suit. The SLS is a semi-closed constant mass flow design and the fresh gas oxygen fraction as well as the fresh gas flow are chosen and set depending on the planned diving depth. Note that the bailout is made at (almost) the same depth as the planned working depth thus making optimization of the bailout rebreather fresh gas oxygen fraction and flow relatively straightforward. According to DIVEX, excursions 10m above or 30 below the bell (i.e. the lockout depth) are acceptable. The gas flows and fractions recommended by DIVEX are calculated to achieve a PO2 of about 1 bar at an oxygen uptake of about 2 L/min. For example, DIVEX suggests that for a 100 m dive the fresh gas oxygen fraction shall be 18% and the fresh gas flow about 28 L/min surface equivalent. For a dive to 500m dive the fresh gas oxygen fraction shall be 4,5% and the fresh gas flow about 72L/min surface equivalent. At this depth the duration of the a SLS Mk II equipped with two 1.33 L tanks charged to 300 bars will be about 8 minutes. Thanks Åke for this additional information! This great picture was sent to me by David Dekker of the Netherlands!